This technique is quick and easy to use for party bags, wedding favors or as little gift bags to make your present that little bit special! Always use the Parchment Paper to protect your project and your iron and in this case its helpful to cut a piece to the size of your Organza bag and pop in the middle of the bag to stop from sticking through to the back. By using different shapes and different colours you can create a range of bags to make each Organza bag unique. his week we're going to wear our piece of art & with the gardening season fast approaching. Handmade by Debbie Frost and available on her blog. This week we're going to wear our piece of art & with the gardening season fast approaching I just needed to have a new gardening t shirt! I've sort of used the paper piecing technique for this but using materials instead. 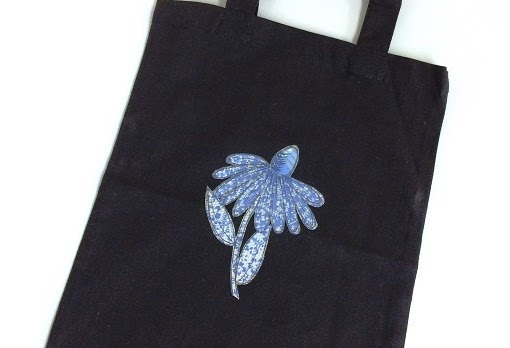 I've printed with Daisy Patch by Francoise Read onto 3 different prints which have been fused onto the Stix2 with Heat Adhesive for Various Material.This stamp is great for the applique look as it has some faux stitching around the edges of the print. 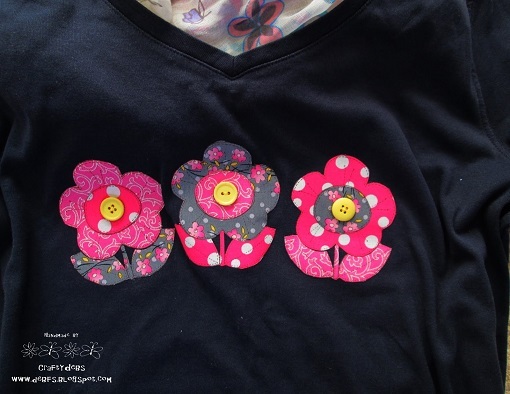 I then cut out different parts of the flowers, mixed them up & reformed them before ironing them onto the front of the t shirt. I have used Crafters ink which is great on fabric & once heat set can be safely washed. To finish off I've added some buttons for the centres of the flowers. The NEW Stix2 with Heat range allows you to make your own Appliques without sewing! Choose three pieces of co-coordinating material then iron them onto the Adhesive Sheet, covering with the Parchment Paper as you go. Heat set using the Iron, each time covering with Parchment Paper to protect your project and Iron from excess adhesive you may have missed. Using the Acrylic block and Clear Stamp, Stamp the flower with the black Ink onto the three coordinating pieces of material. Carefully cut the flower pieces out choosing different elements on each material. Iron each individual piece to create a whole stamped flower applique.